Since 1959, the Association of Military Banks of America (AMBA) has represented banks serving service members and their families worldwide. AMBA is proud to be the only banking trade association serving the military banking community. 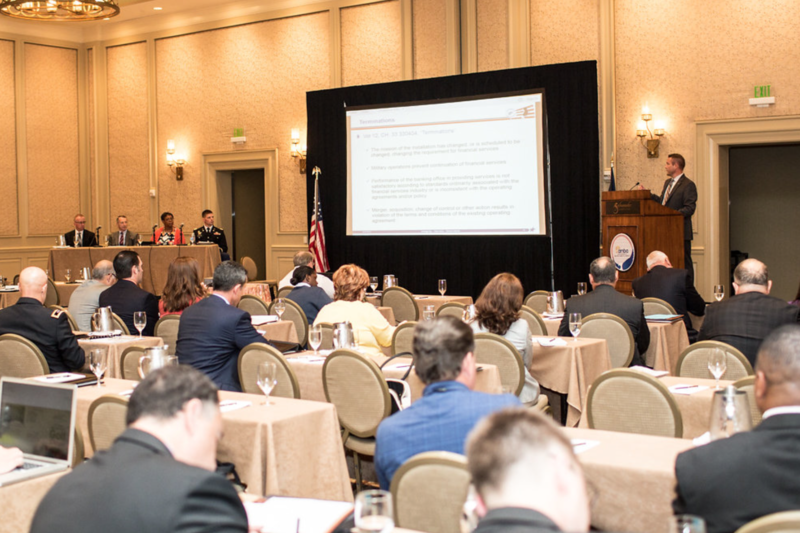 Each year AMBA hosts an Annual Fall Workshop that discusses issues associated with the delivery of financial services to service members and their families. As an AMBA member, you are invited to attend the Workshop. This year’s AMBA Fall Workshop, “New Administration, New Congress: New Challenges, New Opportunities” will be held August 27 – 30, 2017, at The Watergate Hotel in Washington D.C. Please visit this direct link and use the password “amba2017” to register for the Workshop online. Early bird rate are available now until July 15, 2017. The Watergate Hotel is a very popular destination so it is IMPORTANT TO MAKE YOUR ROOM RESERVATION ON OR BEFORE MONDAY, JULY 17, 2017. This year the federal regulators Ms. Grovetta Gardineer from the Office of the Comptroller of the Currency, Ms. Doreen Eberley from the Federal Deposit Insurance Corporation and Mr. Paul Kantwill from the Consumer Financial Protection Bureau with moderator, Mr. Chris Cole from the Independent Community Bankers of America will start out our Workshop on Monday morning, August 28. AMBA welcomes companions of attendees and speakers who attend the Workshop. We have a registration package for companions to attend receptions and our banquet. We also invite companions to attend one of the tours we have available during the day on Monday and Tuesday. For more information and registration, click here. If you have colleagues/partners, you believe would benefit from attending the 2017 AMBA Fall Workshop please share their contact information with us and we can send them an invitation to attend. If you have questions or you need more information, please call us at (540) 347-3305. If you have questions about registration or hotel reservations, please contact our meeting coordinator, Centennial Conferences at (303) 499-2299 or by email atamba@centennialconferences.com.